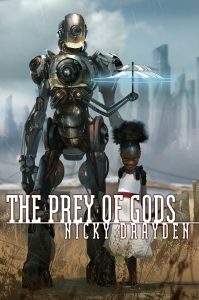 Nicky Drayden Wins the Compton Crook Award for the Prey of Gods! I can honestly say I loved THE PREY OF GODS from the first time I read it. Nicky Drayden had an incredible sense of place, a vivid and imaginative vision of the future that blended myth and science fiction, and a way with voice that made each individual point of view feel natural and distinct. It was an impressive piece of writing, and it was made even more so by the fact that it was her first novel. Unsurprisingly, it not only found readers, it found readers who loved it, just like I did. And with all the great reviews, the members of the Baltimore Science Fiction Society have chosen THE PREY OF GODS as the winner of the Compton Crook Award! On behalf of the entire Harper Voyager team, I want to wish Nicky congratulations on this incredible achievement. We all believe this is just the beginning (and with TEMPER out this summer, we feel justified in that claim), and look forward to the new worlds and stories she shows us in the years to come. The Prey of Gods is available now in paperback and eBook. Nicky’s next novel, Temper, goes on sale August 7. Wish Nicky congratulations on Twitter!